I shouldn’t be amazed but May is over…it went by way too fast! 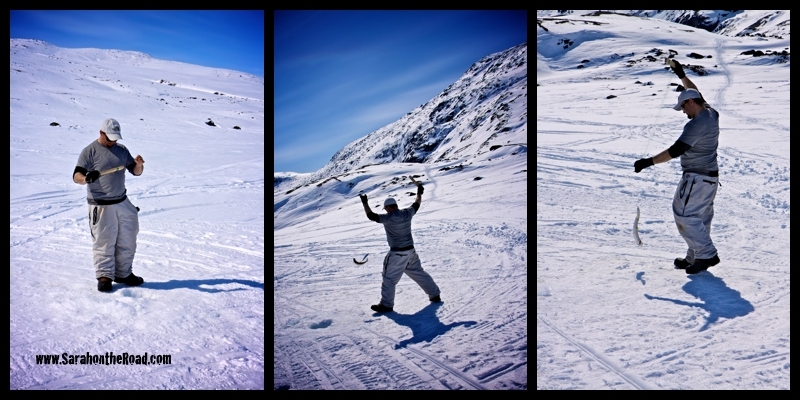 This month a few of my friends joined in the challenge… thanks Mike, Markus and Conni. It was great to see your photos you posted in the Facebook group! 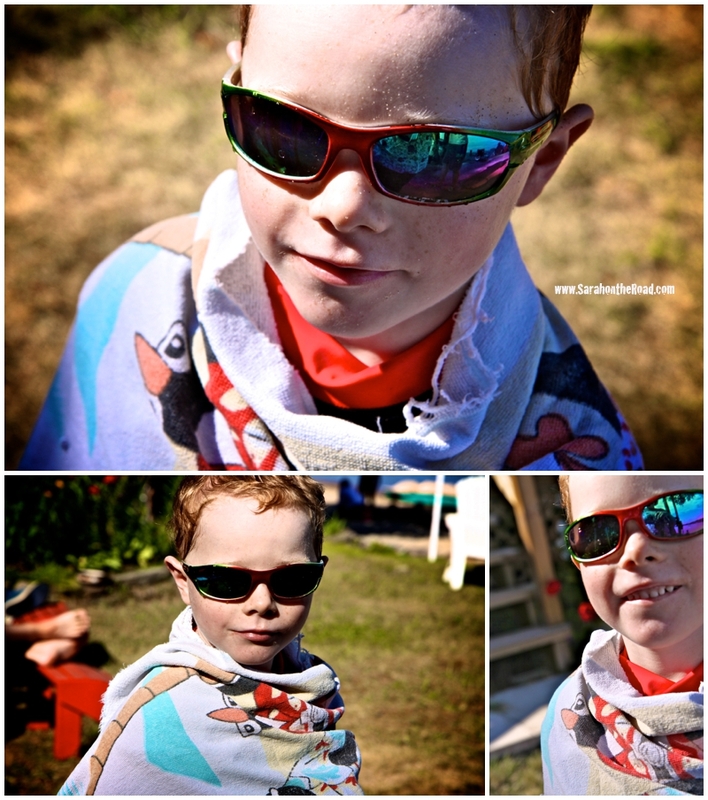 You inspired me to take new and exciting photos… also to use my SLR more than my iPhone! Thank you for that! 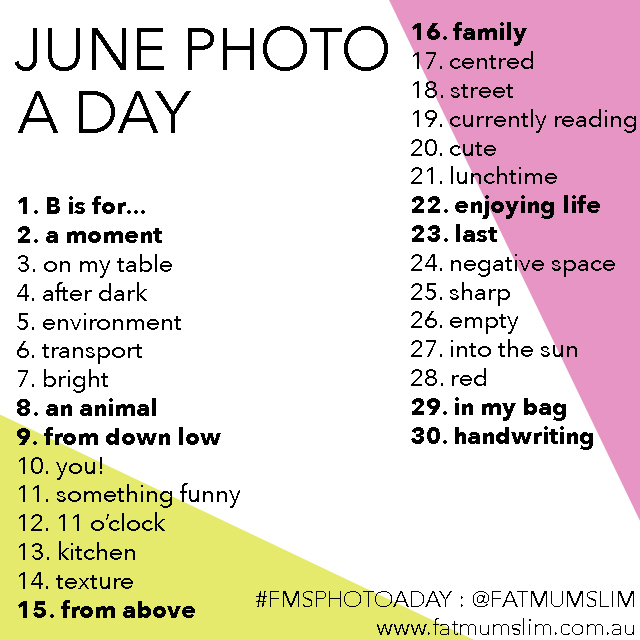 This month I started sharing my photos not only on instagram…but also through the FMS Photo a Day group on Facebook! It was great to share photos there and see all the other photos posted. It was inspiring to see so many moments being captured worldwide…makes the world seem a little smaller when we all were shooting similar topics! 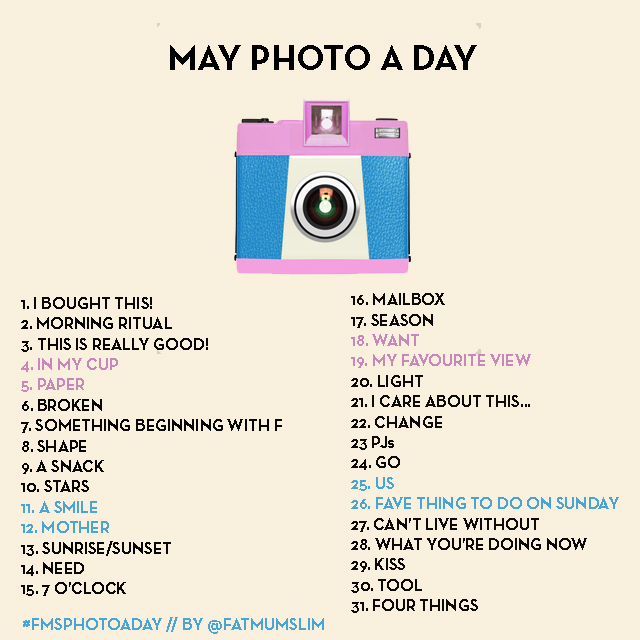 Without any more rambling I’ll leave you to my photos for May…. Can you believe JUNE is here tomorrow? 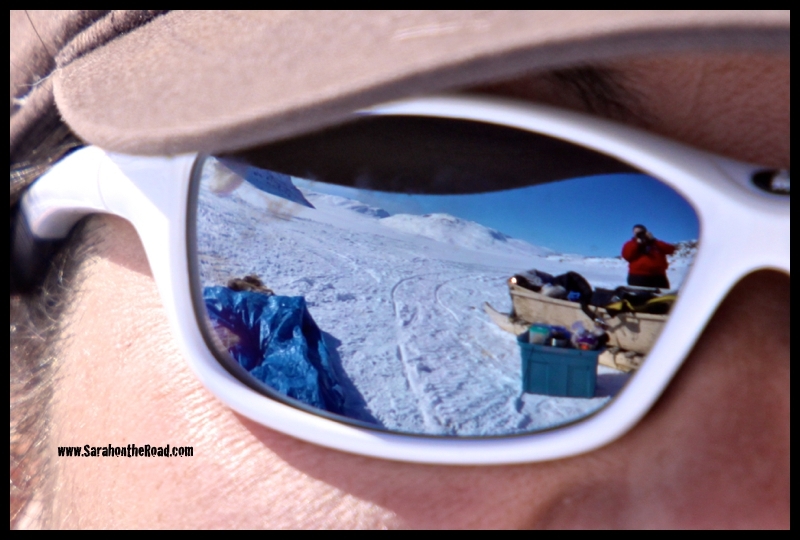 I’m getting excited for this month… as I have an EPIC trip to the YUKON planned! (It’s been in the works since January 2012…and it starts in 18days!!!) I fly south on the 8th…so this month will be fun and there will be random pictures from at least 2 different territories and possibly 2 provinces! 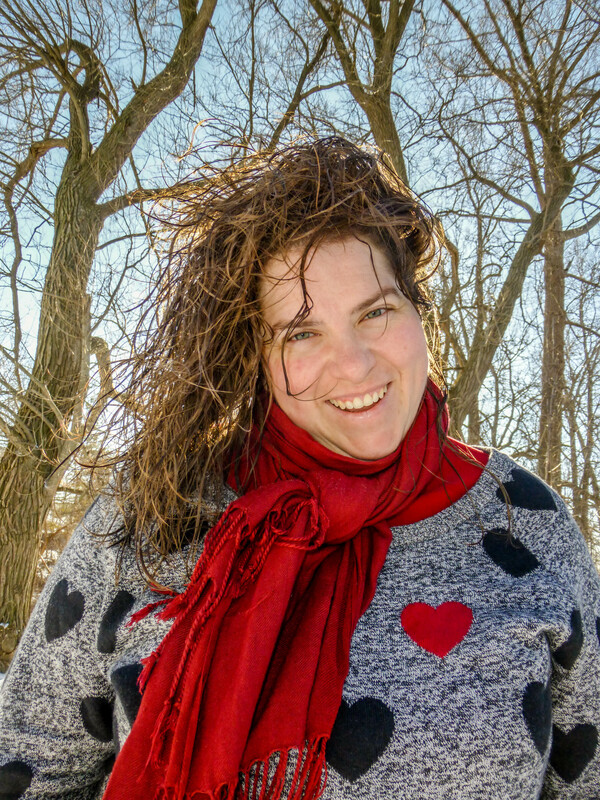 So feel free to join me in the challenge… it’s such a fun project! This entry was posted in Photo-a-DAY-Challenge on May 31, 2013 by Sarah on the Road. So this Raven broke her ankle four and a half weeks ago. Thank goodness this crazy gathering is still just under three weeks away, allowing for a bit more healing time. But it did make a slight change to our plans. All of us had signed up to do a 5k run in the Mayo Midnight Marathon after I had taken up running this winter and had given myself a challenge to be able to run 5k straight by summer. I was incredibly upset that I wasn’t going to be able to do the run and wasn’t sure what could be done since we had already paid our fees to participate. In the end, we all decided that we will still do it, but make it as fun as possible! Instead of running the 5k, we will don our crazy garb (bearded lady hats, capes, dyed shirts, wild undies, etc) and we will walk the route making it as entertaining as possible. I am not entirely sure if I will be able to walk 5k by that point, but I am hopeful since I have been without crutches the last couple of days and am doing my best to hobble around. Maybe I should just bring a wheel barrow and the other Raven’s can take turns pushing me! So if you see a group of 5 ladies walking in the craziest get-up you have seen, don’t call the cops! Just come and take our picture instead. This entry was posted in Indigo's Ravens, Uncategorized on May 30, 2013 by Kara. It’s your bIrThDaY…it’s time to party!!! 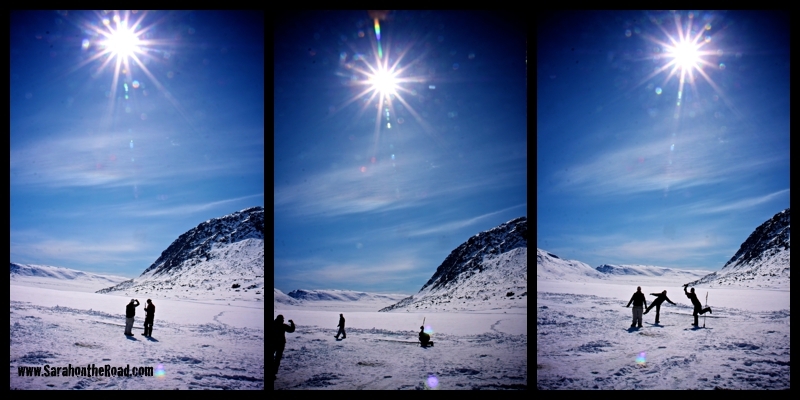 Yesterday it was snowing here in Pangnirtung…but it didn’t stay on the ground! 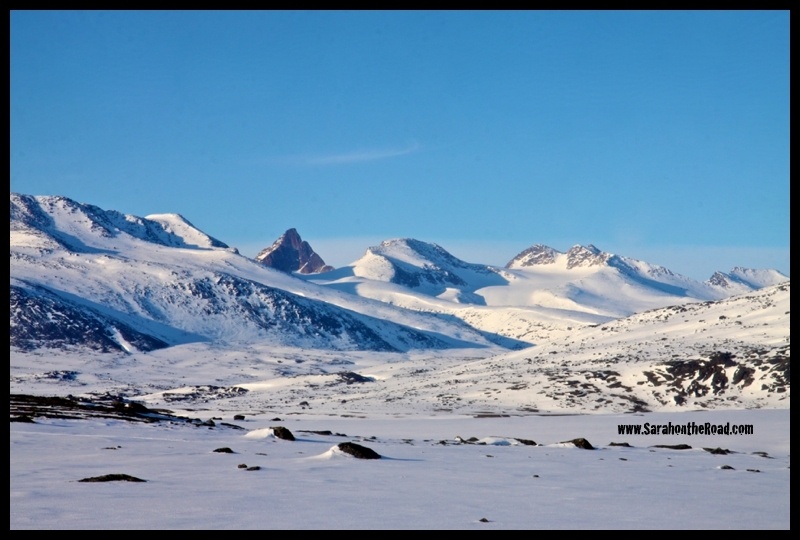 (Can you believe it…snow the day before your birthday?!) It’s a sunny but cool day here… what’s it like in Ontario? I must admit…I can’t wait to hit the beach this summer! 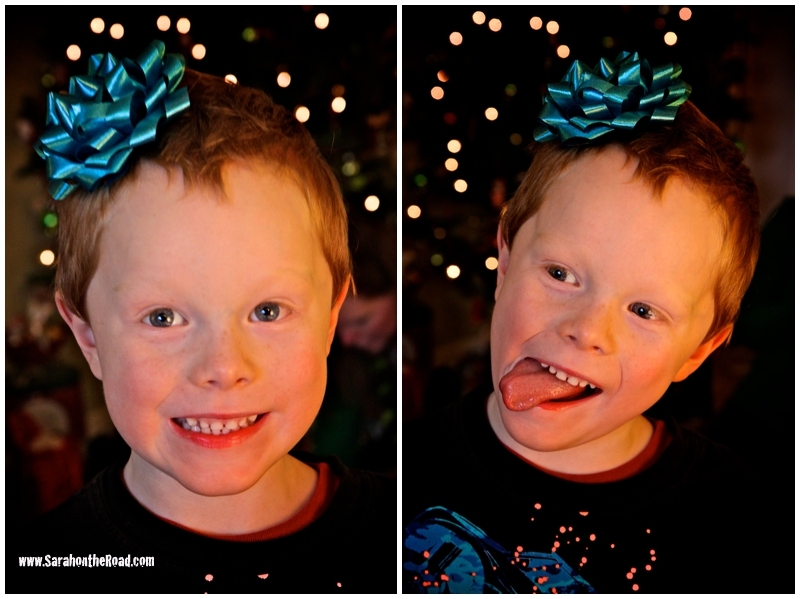 Happy Birthday Benjamin…hope you have a terrific day. 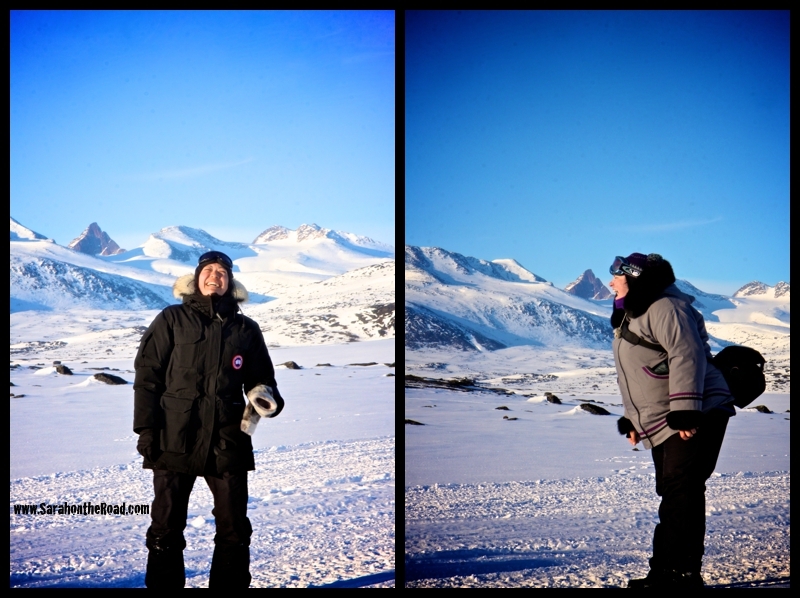 Sending you heaps of love from the Arctic… I left a birthday gift for you and I think your mum and dad have it, so you’ll have to ask them for it! 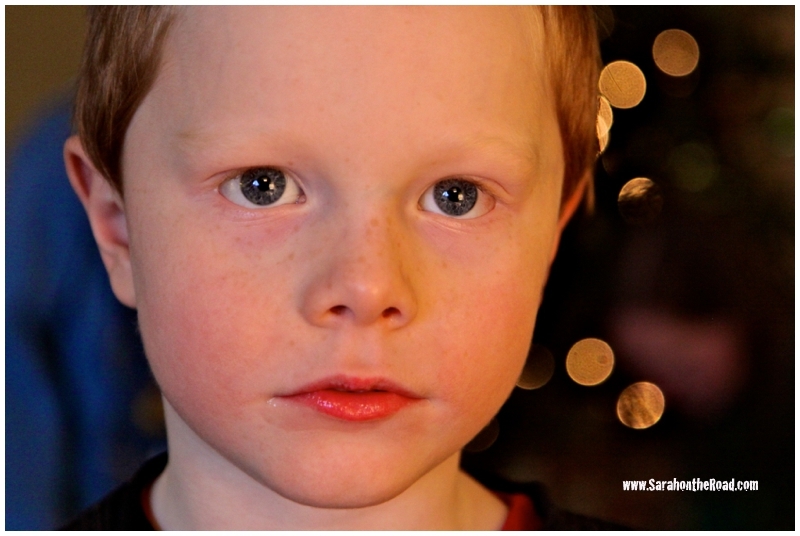 This entry was posted in Birthdays, Family on May 22, 2013 by Sarah on the Road. is has been a fabulous long weekend. 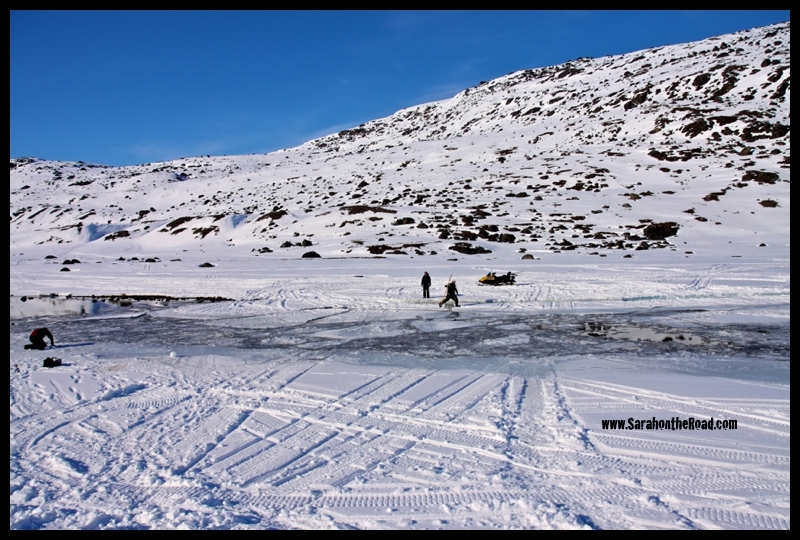 On Saturday I went out with three friends to Iqalujuaq for a day of fun ice fishing! Then Saturday night I had a Game of Thrones Season 3 Marathon with my friend Kaitlin (well only up to episode 6…that’s all I could download before coming back north again!) We ended that about 3am, and the sun was still shining…after some sleep…we got up and watched movies all day long on Sunday! Today I’ve been working on a sewing project for my Yukon trip…and going to a friend’s house for dinner! 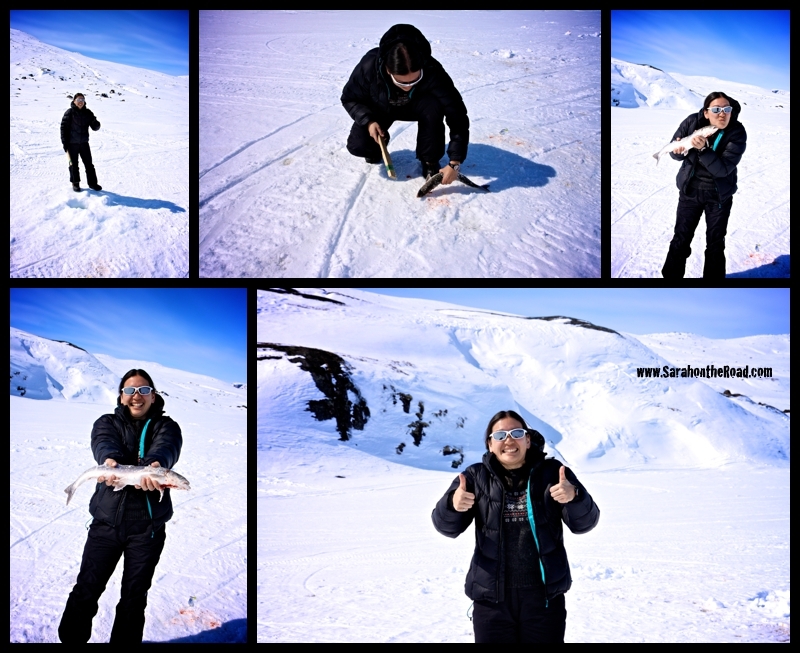 Heaps of fun with friends….but today I wanted to share some photos from my fishing trip on Saturday! 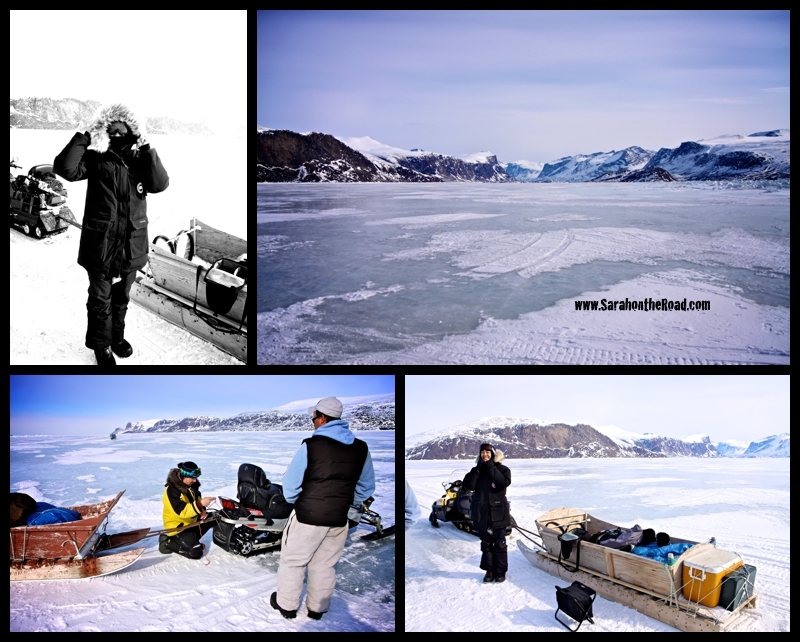 Our first ‘quick’ break on the trail…time for some homemade muffins and a photo op! The lake was pretty full of people fishing…it was a gorgeous day outside! Mary had an awesome day fishing… she caught her first fish! 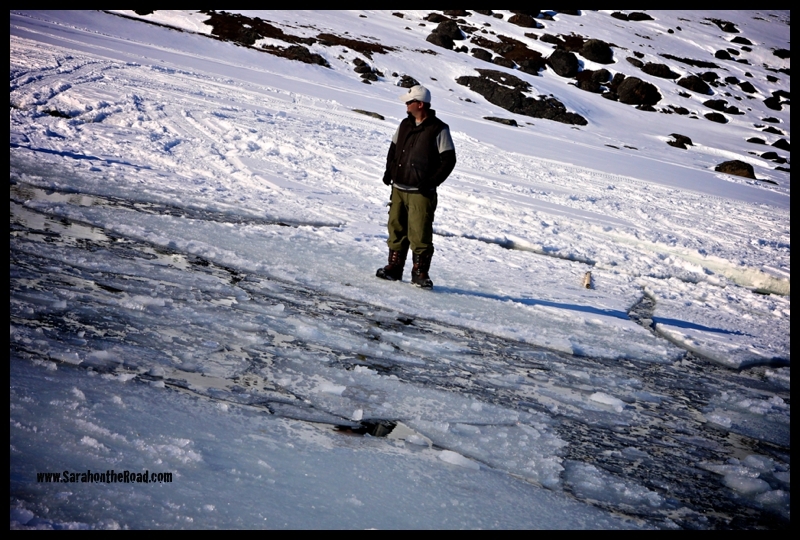 I am holding a ‘tuq’…and i used it to chip away the ice that had frozen in an old fishing hole. It took a little bit of effort and muscle! 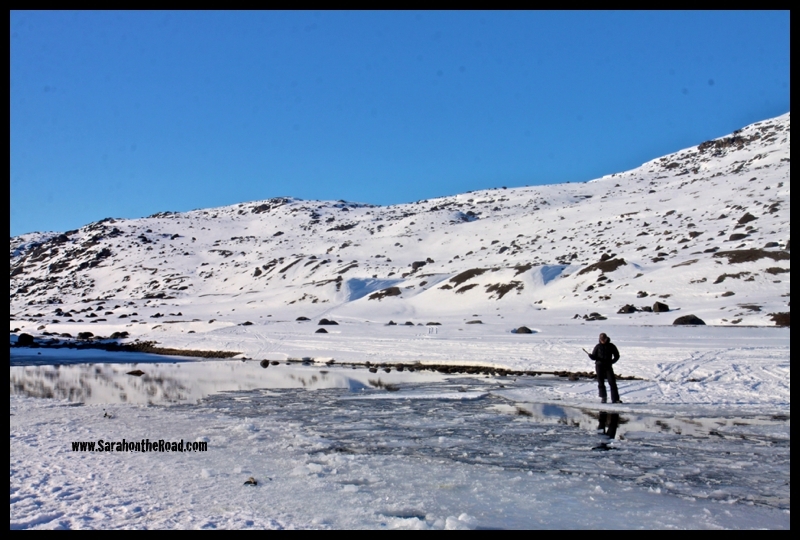 We went to this spot where the ice was a bit thicker…but still had some ‘open’ spots! 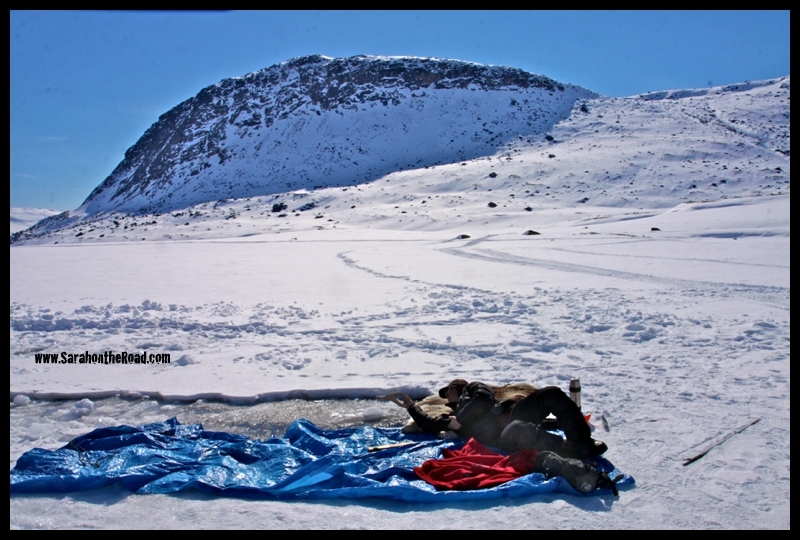 This was one of the funniest way to fish… lying flat on your tummy… when you can see the lure in the water, and the fish swimming by them. I saw like 5 HUGE fish swim by…but wasn’t able to get them! 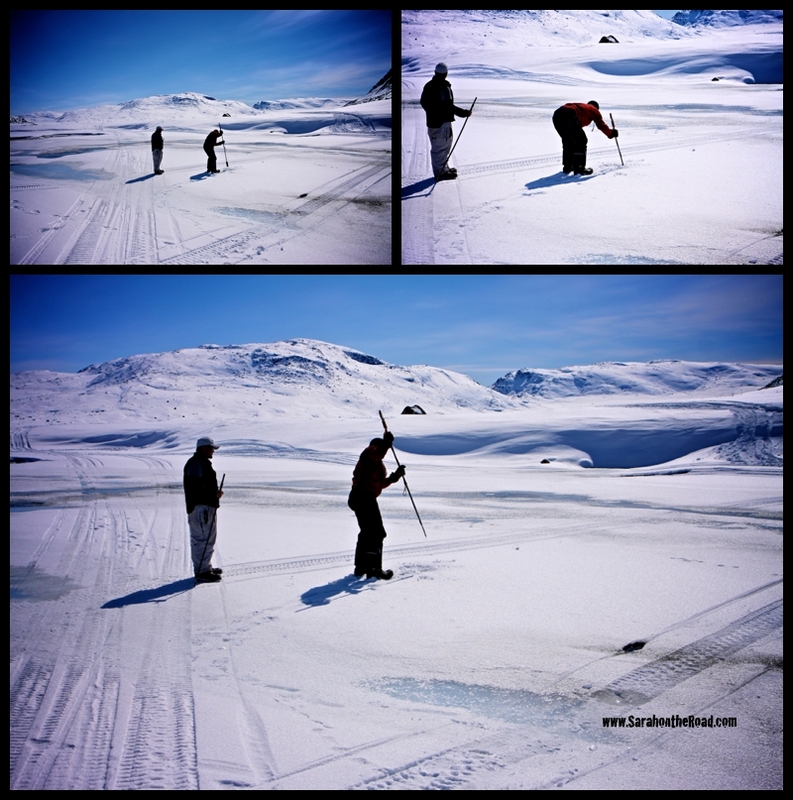 Markus and MIke went back over to the ‘open-poor-ice’ area… while Mary and I stayed behind to fish here, and well ummm suntan and chat! 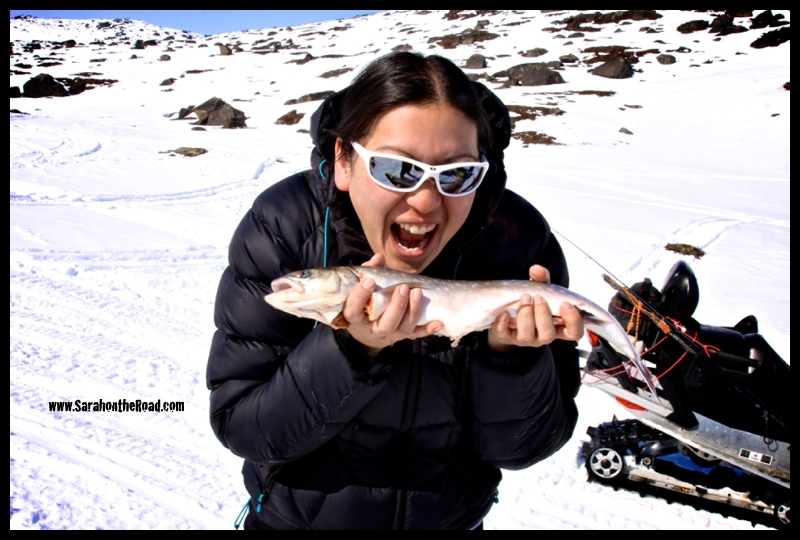 Markus showed me how to gut a fish… I have done it before…but practice makes perfect! 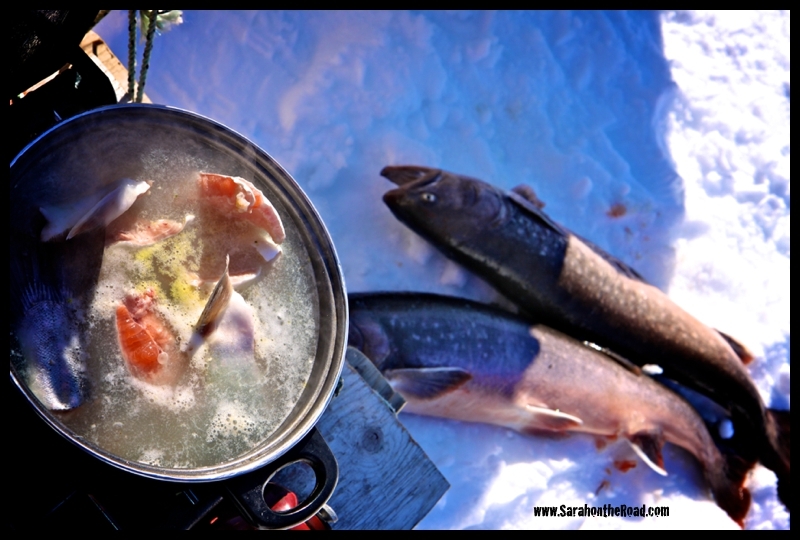 At about 4:30 or so… we decided to cook up some fish… Mary was so hungry she almost ate it raw! 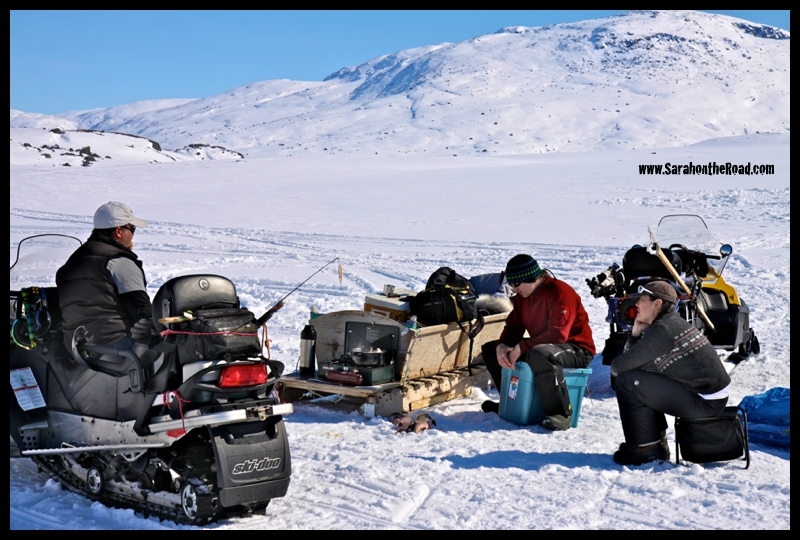 Chill’n waiting for the fish to cook… it was so worth it, nothing like fresh cooked fish out on the fishing lake! It was getting late so we decided it was time to go back and pack up the kamotiks and head for home! 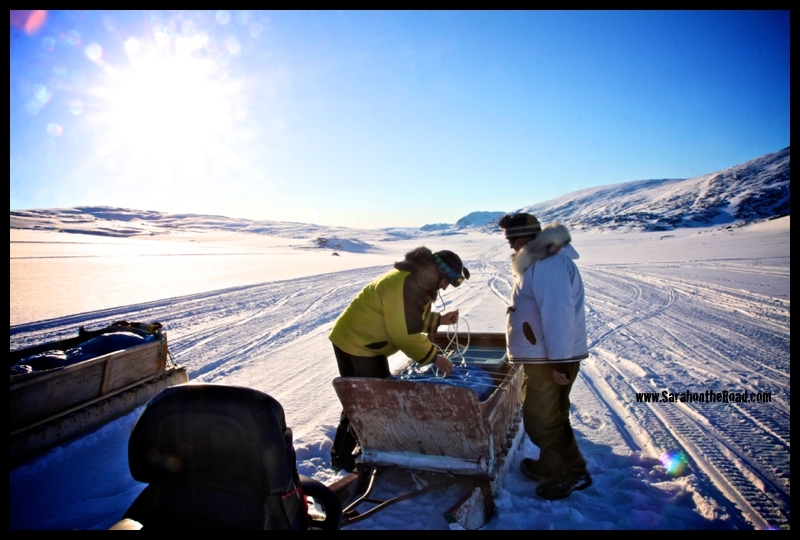 A quick stop on the trail home… and a re-adjustment to the kamotik rope! We did stop at “Toblerone” Mountain for a photo op! It was pretty awesome… evening! 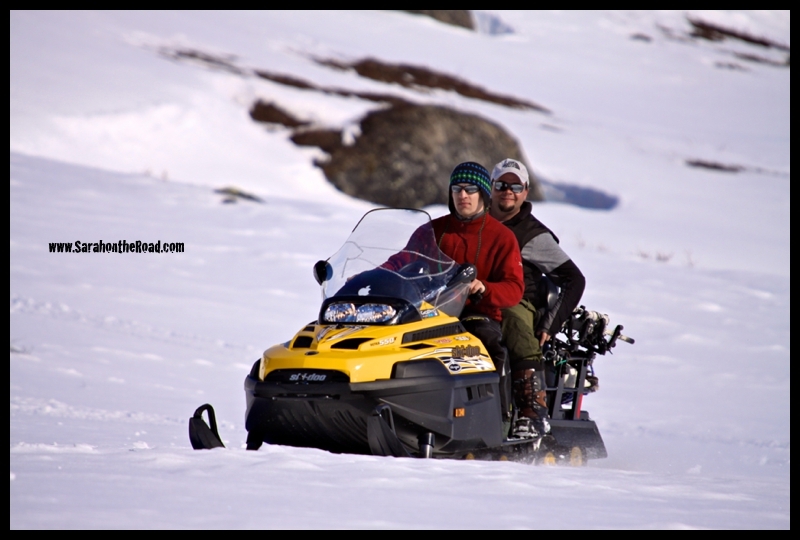 On the way home I saw my first Arctic Hare in the wild… and Mike who had been on the hunt all day…was able to shot it! So that means tonight I’m heading over to Mary’s house to have Rabbit Stew… I can’t wait!!! 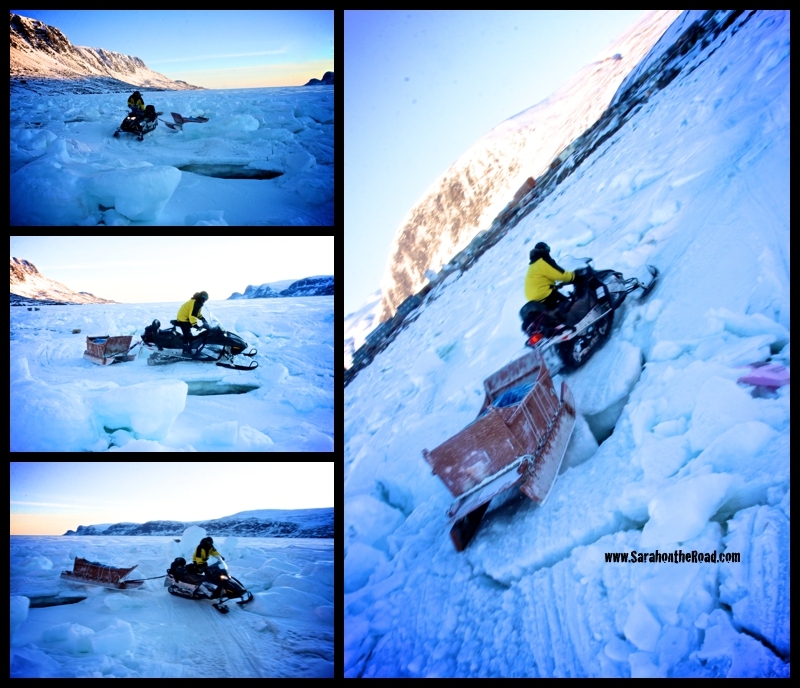 Coming home winding through the tidal ice is always heaps of fun… because of the melting temperatures… there were a few ‘holes’ and cracks between peices of the ice. Markus maneuvered the machine through it like a champ! I was home just after 9pm at night!!! It was a fantastic day out on the land. Thanks Markus and Mike for an awesome day, it was great to get out of town and go fishing! Even though I didn’t catch anything, it was still a fabulous way to spend the day! 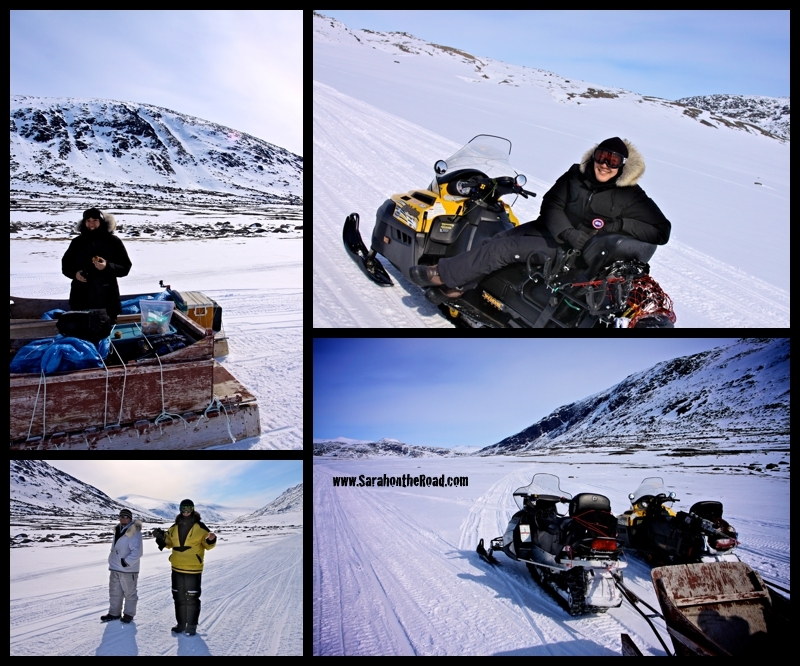 This entry was posted in Life in Nunavut on May 20, 2013 by Sarah on the Road. I think my love affair with 2 sticks of red licorice started with a little help from my Gramma. My Gramma use to pack my school lunch from kindergarten until grade 3 or so. Those lunches in my early days of school were so amazing-often having way more food than I could ever imagine eating. Thinking back it could have been because I was a kid, and everything you remember when you were a kid was HUGE…but in reality they were just normal –not that huge to begin with. But I kind of think that they were just in face HUGE lunches! I always remember opening my lunch box to surprises. Sometimes inside my lunch box was a handwritten note. Sometimes I was surprised by the food choices she had lovingly put inside the lunch box. Like hot-dogs in a thermos (with small jars filled with ketchup and mustard) with the buns in a baggie. Some days it was soup in the thermos or sometimes just a sandwich. Then there was fruit, or cut up veggies and dip. Then dessert- homemade cookies or other yummy things like Rice Krispy squares. Why am I telling you all about these amazing school lunches? You might be thinking it has nothing to do with red licorice. But that’s the thing, because the last thing Gramma almost always had in our lunch was her secret ingredient to the end of a perfect lunch -2 sticks of Red Licorice. As a kid I remember searching her kitchen, pantry and cupboards on the weekend or after school to find the source of the red licorice…but she was a good hider of the licorice and I never found it. I got to go visit my Gramma earlier this month. Before I left her house…she gifted me with a present she picked me up from Costco. Can you guess what it was? 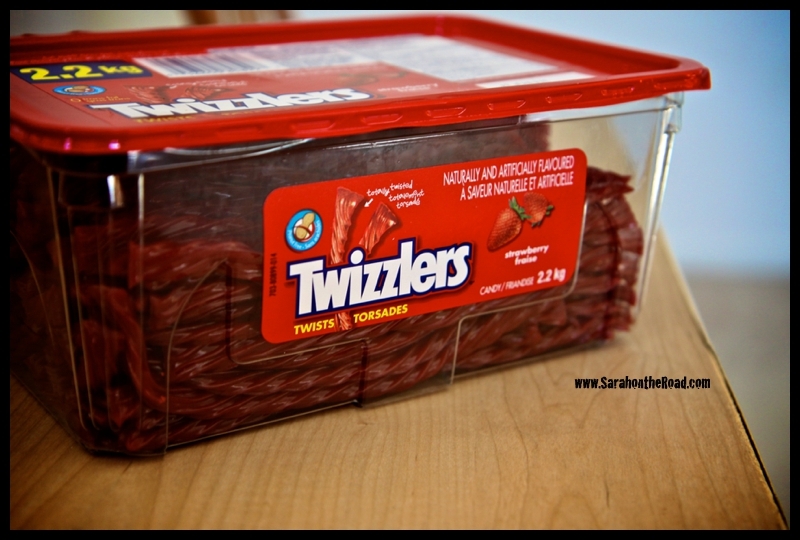 Yep… a HUGE box of RED LICORICE!!! I’m trying to keep it to 2 sticks after lunch…but I might be failing at that. 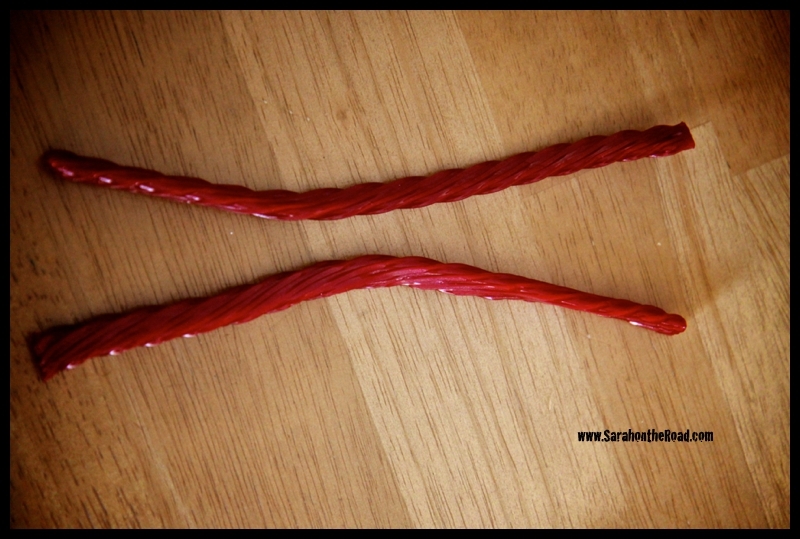 It’s funny how a simple thing like a stick of red licorice brings back so many awesome memories. 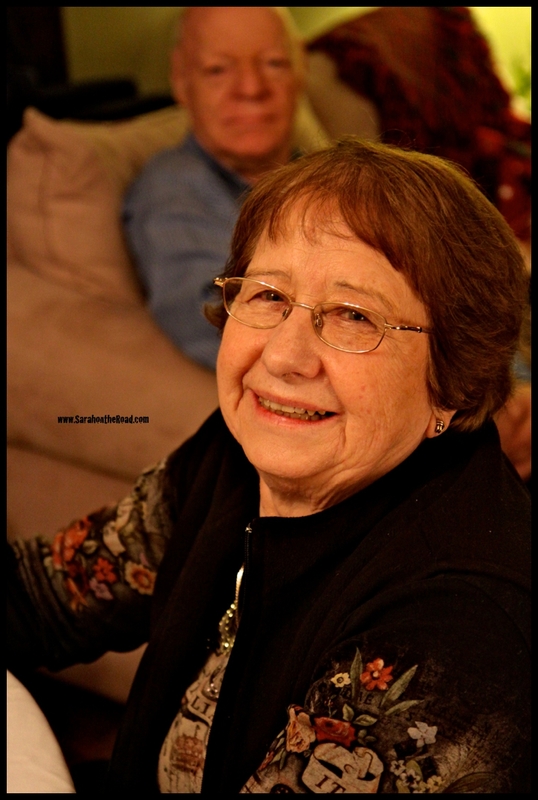 Luv you Gramma, thanks for the licorice…see you next month! 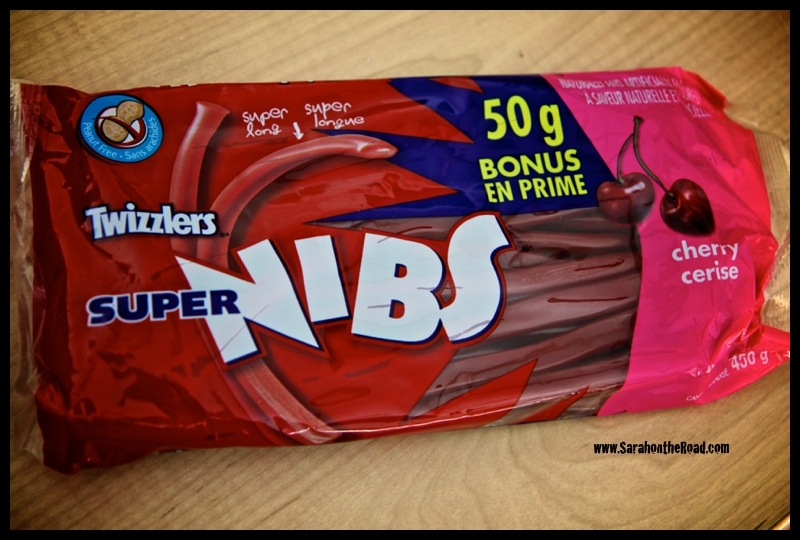 *this post was not sponsored by Twizzlers and the opinions are all my own! This entry was posted in Family on May 17, 2013 by Sarah on the Road.